How It’s New York: It’s one of those hot tickets for a short run, and takes place at the lovely Baryshnikov Arts Center, a new New York Institution (founded 2005), who coproduce with Irish Arts Center. This show is part of Imagine Ireland’s year-long initiative. 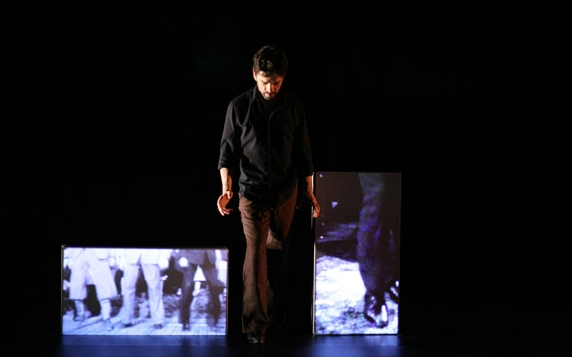 How It’s Irish: Colin Dunne is a former principal in Riverdance, and in his show he stages a dialogue with his own history and the history of Irish dance. Irish dance is odd in many ways. It’s very precise, it’s very difficult, and it’s so niche that it has an almost universal appeal (see the movie Jig for proof! Many of the best dancers have no particular Irish heritage). Until the 20th century and Riverdance, it was a stand-alone form, not connected to larger stage shows in an intrinsic way (it existed a little in shows on Irish themes, see Boucicault, or the Fabulous McNultys, but didn’t really cross into Broadway, like tap dancing). 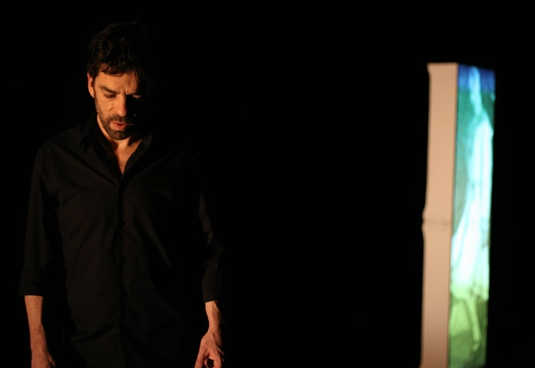 in the 21st century, a few dancers like Maire Clerkin and Breandán De Gallaí have tried incorporating dance into storytelling and theatre, moving the form into the real previously held mainly by ballet and modern dance. Now Colin Dunne presents and deconstructs the form with his piece Out of Time, using looped sound, slow motion, and vintage film screened on different sides of a square block that hinges and unhinges to form a rectangle. And there’s also some film screened on the high high backdrop. The film is important, because Irish dance is in the process of re-inventing, or at least restablishing, itself. Dunne has been a world champion since he was a little boy (one of the best sequences is a shot of him dancing on television, all sweet pink cheeks and inarticulate pride). Since then, he’s won 8 more, for a total of 9. He went back to school in 2001 to get an MA from the University of Limerick, which in itself is rather a daring thing to do. The education shows in the piece. At times, it did feel a bit like an overeducated, deconstructed graduate school piece. But that’s not a bad thing, and this long conversation with the past is one worth listening in on, even if you don’t get all the context of the conversation. 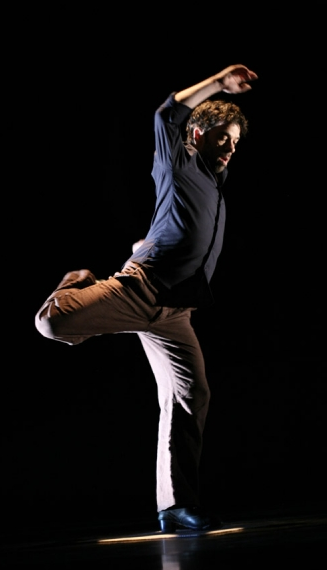 He starts out barefoot, in a black t-shirt and white jeans (costumes by Joan O’Clery), swinging his legs slowly, fluidly. There are recordings of a voice saying “lovely”, and “cheers,” and tapped sounds– although he has no shoes on, which is disconcerting and fascinating (sound engineer Fionán de Barra collaborated with Colin on the score, which also includes radio microphones attached to his shoes, and whistling). Then he begins talking about the hornpipe. “What is a hornpipe?” he asks, and explains how it’s like a jig, then seems to be at a feis, as a voice says “last call for number 22’s hornpipe.” As he dances he also recites something like a dance rap describing it, “Lovely, brutal, amazing, brutal,” going down with his voice on the word “brutal.” It’s really absorbing stuff, but clearly will mean a lot more to you if you have a background in dance and feis and commentary. When he puts on shoes, another section begins, a playful dialogue with the sound shoes make. At one point it sounds so convincingly that he’s being followed, heads swivelled to see the other dancer who had come onstage. And yet it’s not just recorded– the sounds are clearly responding to what he’s doing. There’s a whooshing sound when he jumps that sounds like the noise a video game character might make. The way the sound matched his movements did suggest something like Tron, in an odd kind of way. In another section, his shoes seem to make xylophone sounds and notes. The vintage film of dancing from the 30s on from RTÉ is wonderful (film design by Sean Westgate, film titles after the jump). The dancers look very light on their feet, and mostly are wearing ties and jackets, adding to the strangeness. At one Colin turns the blocks upright (box construction by Colin Barclay and Mike Burke) and we see film of a woman dancing, but the blocks aren’t quite tall enough for her head (in a later sequence we see a montage including her, and do see her head). The lighting by Colin Grenfell beautifull highlighted both Colin and the film, which is no mean trick, and director Sinéad Rushe both kept the pace up and used the space so that the eye could take in the right thing at the right time. When large curtains pulling back upstage it’s a surprise, as we’ve grown used to seeing film projected on the block. There is a long montage of Irish dance, mostly legs, some black and white, some color, and one little boy’s. Then we go into the clip of Colin on TV (on Blue Peter), and realize he’s the little boy. “Is it tricky?” asks the inane interviewer. “Not very,” he replies. Colin looks as if he’s ready to fly while he watches the film, and his enthusiasm draws you in; it makes the film very important. After a laugh at the awkward segue she makes back into the show, Colin goes into a set piece about jigs called “rashers and sausages,” then begins talking about dance as a competitive art form, how dancers would dance on a square. If no winner was declared, the square would be raised up, and greased. It’s fascinating stuff and entertaining too. Then he starts showing us what he can do. It’s exciting to watch him “skate around” after explaining that traditionally dancers didn’t cover a stage, and he seems nearly airborne as he dances to recording of Martin Hayes and Dennis Cahill. There’s a section in the middle where he half dances in disco style which gets laughs– then he’s back to flying as Martin goes into his version of the Pachelbel Canon. That is one of the most exciting pieces of music ever recorded, and Colin’s legs beating the air to it make this an unforgettable theatrical high. It brought home to me that, interesting as the piece was, I still prefer my dancing with music, and the whole package together. But it’s also wonderful to recognize that by being led to it. Performances of Out of Time takes place at the Baryshnikov Arts Center’s Jerome Robbins Theater, Wednesday through Saturday, October 19 to 22, at 8:00 PM. Tickets are $25 and can be purchased through BACNYC.ORG or 866-811-4111. The Baryshnikov Arts Center is located at 450 W. 37th Street, New York, NY 10018. Films in the show include: King of Spades, a documentary made in 1935 at the Monard Mills in county Cork. Dancers include Wille Hayes, Jack Hayes and Peter Hayes, joined by Jim Murphy, all of whom were spadesmiths a the mills. Áine Ní Thathaigh, from 1955, take at St John’s Pavilion in Limerick, the year she won the All Ireland Championships, and a note says “the original footage was largely shot with Aine’s face out of the frame, which is fascinating. I’d have liked to know that, because there’s a gender issue in there, I think. Paddy Ban O’Broin comes from the RTÉ show Ag Déanamh Ceoil, in 1972. He is accompanied by Dessie O’Conor on the whistle. Other dancers appearing are Seán Cullinane, John Kenneally, Martin Grioffa, and Kevin Massey. And Colin himself appears on Blue Peter. Just wondered how you got the film of Jack Hayes and his brothers dancing the hornpipe in the 1935 Pathe News film? Jack was my uncle and lived in Monard Mills. I now live in a cottage, opposite the river that once worked the water mills here. It still has a magic about the place. Unique. My brother bought the whole site to keep it in the family. History of Monard goes back to 1792 when the Quakers settled here. I have a copy of the film myself but understood that it was now under copywright by an unrelated person? Perhaps you can comment. Amazing to think of my uncles in a film in the U.S.!! !